Dependent on habitats in Canada, the United States, and Mexico, the monarch butterfly illustrates the need for international ecological cooperation and conservation. The monarchs' migration spans generations. During the summer breeding season, monarchs live only 2-5 weeks. Each successive generation—and there may be as many as four within the breeding season—continues the northward journey. The last generation of the year migrates south to the oyamel fir forests of Mexico. On their northward journey, the monarchs feed on the nectar of many flowers, but lay their eggs only on certain varieties of milkweed plants. Designated as noxious weeds in some areas, however, milkweeds are often eradicated. The monarch's winter habitat in Mexico's fir forests is shrinking. Because all monarchs gather in only a few locations during the winter, the overall population is especially vulnerable to disruptions, deforestation, or harsh weather. Traveling between 50–100 miles a day, the monarch's migratory journey may be 3,000 miles long and take two months to complete. The last generation of a breeding season must attempt the entire reverse journey back to Mexico. These tiny travelers weigh less than a gram and may live as long as nine months. 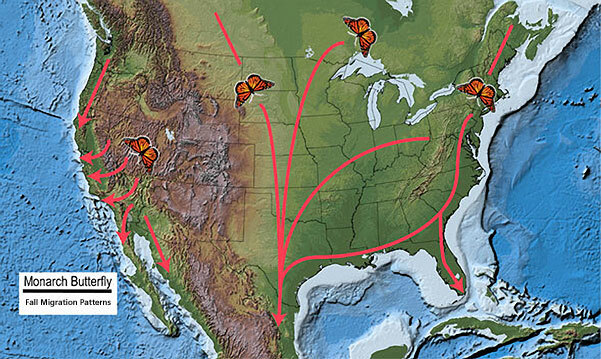 Monarch Butterfly Fall Migration Patterns. Credit: Base Map, USGS National Atlas, USFWS. In the late part of the winter and early part of the spring, millions of beautiful Monarch butterflies make their way from Mexico into the United States. However, scientists are concerned that the change in global weather patterns may change this migration pattern. How Do Monarch Butterflies Migrate Every Year? They have an internal sun-compass in their mid-brain. Their antennae function as a sort of clock. However, these butterflies head south each fall and north each spring. Scientists believe that they respond to the change in temperature and that is what prompts them to change their direction. Warming temperatures may not give the butterflies the prompt, so they may not change directions at some point. This theory was actually tested with an experiment conducted at the University of Massachusetts. The scientists used captured migrants from the fall migration. When they changed the temperatures, this changed the direction that the butterflies wanted to fly from south to north. These scientists admit that they still do not know a lot about butterfly migration. However, the results of this experiment seem to suggest that temperature is key to which direction the butterflies decide to travel. In the fall, these butterflies travel to an area of Mexico that has been heavily deforested lately. Since the creatures rely upon a delicate balance in their ecosystem, this has resulted in the populations of these butterflies decreasing as the number of their habitats have been reduced. Why Do Monarch Butterflies Matter? Of course, these butterflies are beautiful and majestic. But does their survival in nature actually matter to people and the environment? Like bees, butterflies can also serve as natural pollinators along the paths that they travel. For example, Monarch butterflies rely upon milkweed for food and as a place to lay their clutch of eggs. In turn, the butterflies serve to pollinate these plants. However, Monarchs would be missed in other parts of the food chain, as well. During the annual migration, the butterflies serve as a food source for some birds and animals. Small lizards and black-headed grosbeaks are a couple of prime examples. Without this food source, the populations of these animals would struggle. In turn, declining populations of these species would impact other plants and animals. Indeed, the loss of the annual Monarch might seem like a little thing, but it would be felt in major ways. Is There A Solution To Preserving Monarch Migration? There is little doubt that the Earth is warming and has been for about a century. The issue is that this change has increased faster than animals can adapt to it. If people do not act to preserve flora and fauna, it may become difficult for even humans to adapt. NASA recently released a report that 97 percent of scientists in the world agree that the planet is getting warmer and that people have to take action. In order to preserve this historical migration, habitats have to be preserved. It is possible that a corridor or natural habitat could be maintained to keep these butterflies navigating between Mexico and the United States each year. Although there are butterfly habitats that may help to keep the species thriving, the only butterflies that future generations may see will be in these artificial environments and not in nature. This beautiful video fully describes the migration these winged beauties, produced by Eduardo Garcia Milagros, Ari Daniel Shapiro, Jay Allison and Atlantic Public Media.